Fishy Fishy really stands out in Brighton. The interior is well considered and has a nicely designed brand, not saying that our home grown restaurants don't, but many clearly launch on a budget. A heck of a lot of them wouldn't be able to survive with the location either, which is tucked right away in a corner in East Street and hard to spot unless they have their bannered seating area out. But I like it. It gives it a quirkiness that may have seemed too sanitary in a more convenient or newer location. Having been here for five years now, it's had time to bed in. Amazingly for a costal town, Brighton historically didn't have too many decent fish restaurants to its name. I could see why with investment eyes on, it would be an ideal place to launch but Fishy Fishy now has some seriously stiff competition in the city. Saying that, the other well-regarded fish restaurants have slotted into the more premium market with plenty of chippies and touristy fish restaurants at the other end of the spectrum. Fishy Fishy cleverly aligns itself in the middle of this, appealing to people wanting a decent feed in a smart/casual setting without spending a small fortune. It would be as good for an intimate lunch date or to bring the whole family down. 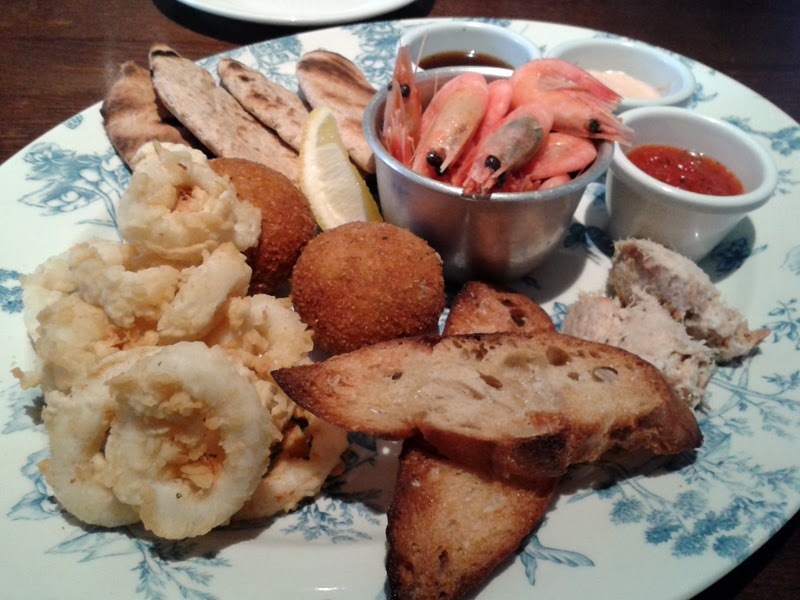 We started with a sharing platter (£15.50) which had a selection of the popular starter dishes. The shell on prawns were really fresh with homemade marie rose sauce. I particularly liked the smoked mackerel paté with toasts that had been oiled and salted, a detail I appreciated. The batter on the calamari could have been crisper and the fishcakes seasoned a little heavier. I would also have liked a little nip of chilli to enhance the Thai flavours too. Overall though, a good start to the meal. 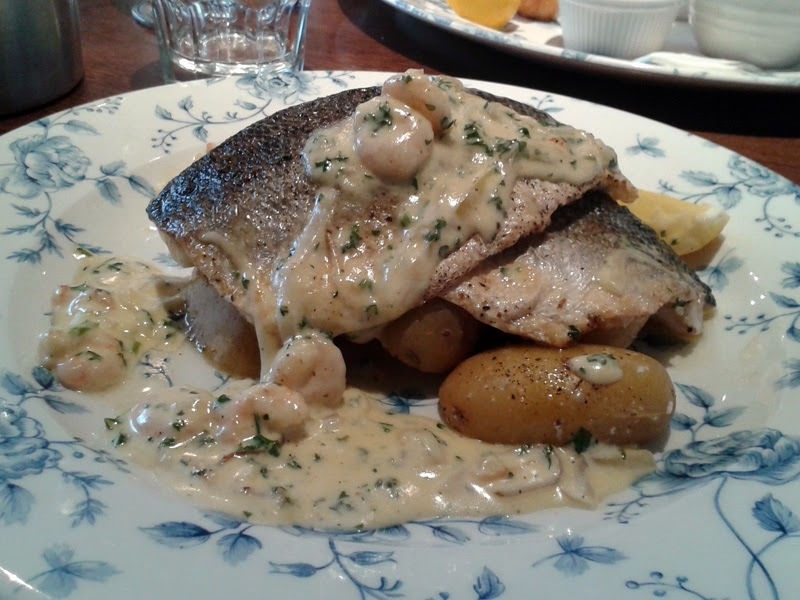 For main I chose the market special which was the sea bass, served either on the bone or filleted, with a prawn and cream sauce (£16.50). I adore sea bass and this was a generous portion simply cooked as it should be. I'm usually not much of a fan of cream sauces but this worked really well and had fresh flavours from parsley and lemon to prevent it from being too rich and cloying. The new potatoes and green beans were all that was needed to complete the dish. There's not too much else to say. I thoroughly enjoyed it. 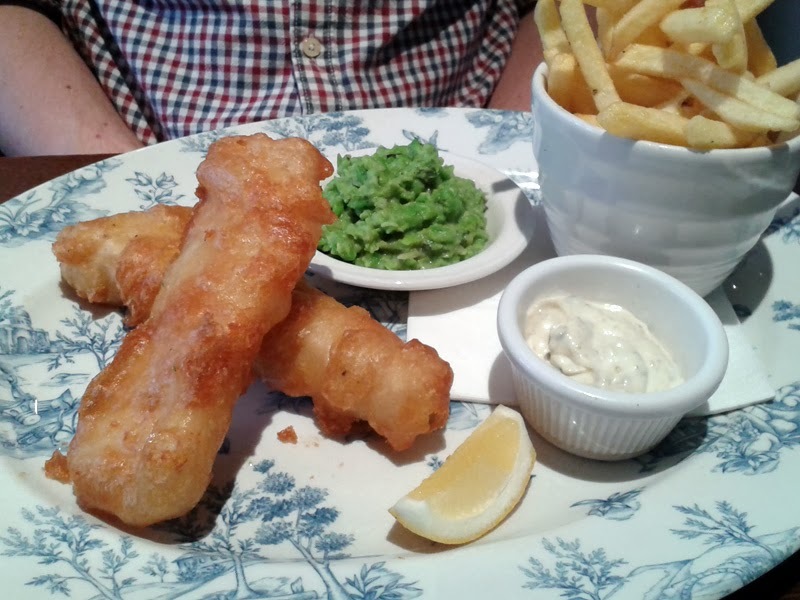 Mr GF went for the—deep breath—Fishy Fishy Fish and Chips (£10.95). I did try and get him to read the whole dish name out to the waiter but he wasn't playing ball. Spoil sport. The batter on the fish was beautifully crisp, the minted peas fresh and not to soupy and the fish itself soft and sweet. The only preference change would be to ditch the fries in favour of some chunky, hand-cut chips. Can I take a moment to mention the plates? I know I bang on about plates but how lovely are they here? Smart choice too as fish can sometimes look a little bland on the plate and the blue pattern lifts it visually. 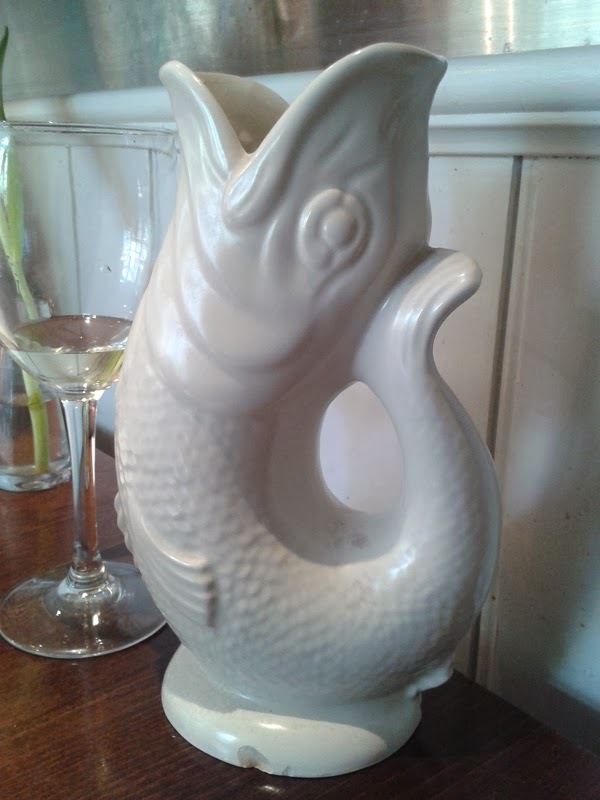 The water jugs were also fish shaped and a nice nod to Brighton's symbol which appears on railings and fountains, not sure if intentional, but there you go. 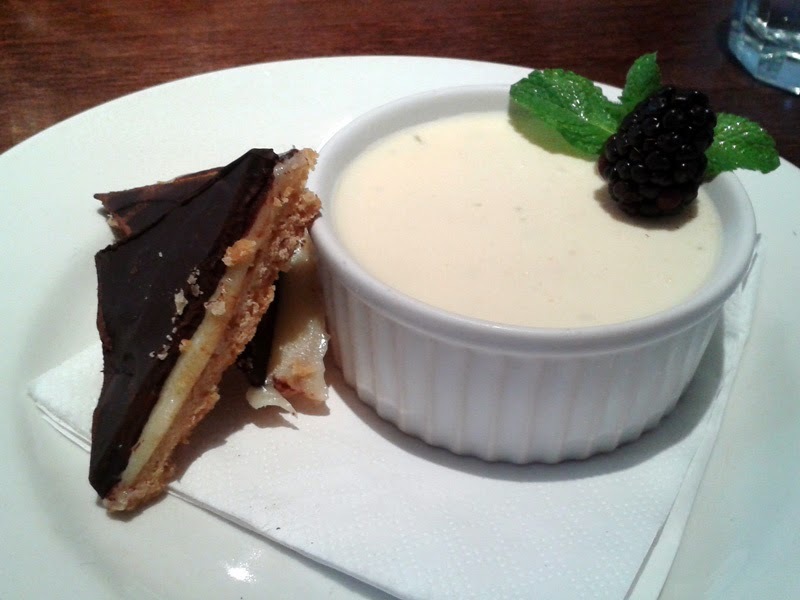 We polished off the meal by sharing a lemon posset. Thankfully, we were sharing as it was quite large with two pieces of millionaires shortbread, but then I don't have an overly sweet tooth. Although there were a few small things I would have tweaked with the food, lunch was really pleasant at Fishy Fishy. Sustainability is at the heart of the produce with local and seasonal fish and shellfish and the menu is varied from fruits de mer platters and dressed crabs to fish curries and soups. 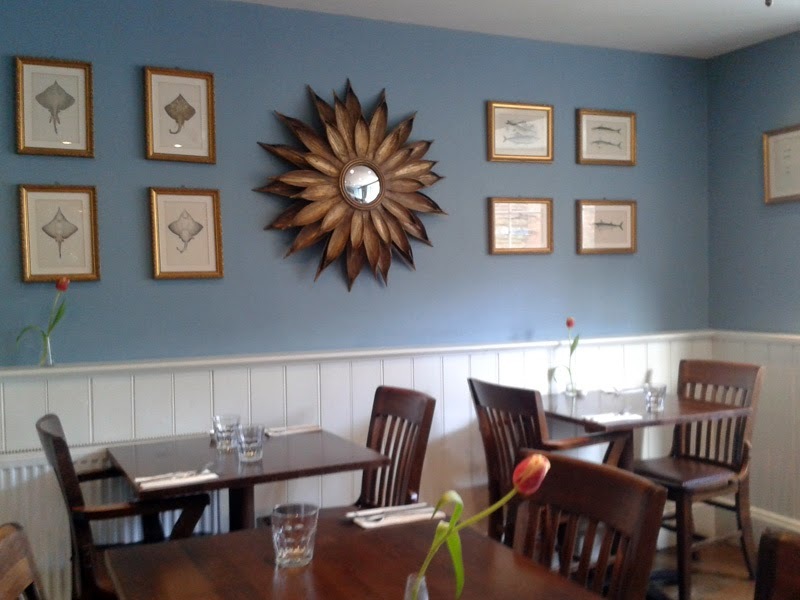 As I said, if you want a good quality, honest meal that is well priced then Fishy Fishy is a decent choice. I was invited to review Fishy Fishy.